VietNamNet Bridge – Vietnam’s first-ever high speed train running from Hanoi to HCM City is projected to cost more than US$58 billion, project consultants unveiled on Tuesday. In a report on the feasibility of the colossal North-South railway project which was once rejected by the National Assembly and only revived recently, a group of State-owned consultant companies including the Transport Engineering Design Incorporation (TEDI), Transport Engineering Design Incorporation in the South (TEDIS) and Transport Investment and Construction Consultant Company (TRICC) suggested building a rail route of 1,545km divided into three sections for separate investment. 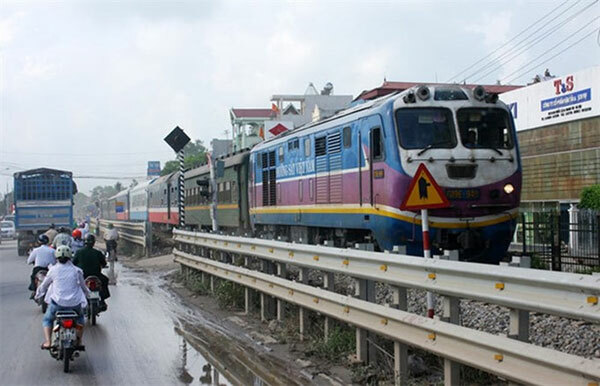 Rail sections running from Hanoi to Vinh City in Nghe An Province (285km) and from Nha Trang City to HCM City (364km) are planned to be built first with investment of more than $24 billion. They are due to be finished within 10 years, from 2020 to 2030. The longest section of all – 896km of railway connecting Vinh City and Nha Trang, is yet to have any construction dates planned. The consultants said that the high speed railway would best attract passengers and be able to compete with the soaring aviation sector if trains run at a maximum speed of 350km per hour. That is equivalent to the speed of Japan’s iconic bullet trains. According to the report, the slower the trains are the smaller the market share the network will attain. If the trains run at 200km per hour (kph), for example, only 2.7 per cent of passengers on the Ha Noi- Nha Trang section will choose it as their means of transport. On the other hand, the rate can reach up to 14 per cent with train speeds of 350kph. The consultants, however, suggested that the speed should hover around 160 to 200kph at first and increase to 350 when the whole North-South rail route is completed and comes into full operation. With such a high speed, travel time between Hanoi and HCM City will be cut dramatically to approximately 4.5 hours, compared to the current 30 hours on the train and about one hour and 40 minutes by air. According to the plans, trains will stop at over 23 stations with 70 per cent of the route running on bridges and through tunnels. The consultants proposed applying the electric multiple unit technology, which is widely used in Japan, France and China, to minimise infrastructure costs. Viet Nam Bridge and Road Association vice president Nguyen Ngoc Long called the North-South high speed railway a mega-project at the same time as Vietnam is investing in other colossal projects like the North-South Expressway and the aviation development plan. He asked the consultants to provide a traffic forecast for the project in order to consider the best proposal and avoid wasted investment. “Speed proposals should also be considered carefully, but whatever is selected must guarantee the standard speed of 350kph,” he said. Vu Hoai Nam, a lecturer on urban railways at the University of Construction, said that the project would demand a huge sum of capital investment and should therefore have a thorough risk assessment, which the consultancy report is lacking. “If (we) fail to calculate various issues like the payback period and land clearance, the risk will be huge,” he said.